Line 8x4-inch loaf pan with plastic wrap. Place chocolate, butter and corn syrup in large saucepan; cook on medium heat until chocolate is completely melted, stirring constantly. Beat 1/2 cup of the cream and the egg yolks in large bowl until well blended. Gradually stir into chocolate mixture. Cook 3 minutes, stirring constantly. Cool to room temperature. Beat remaining 1-1/2 cups cream, sugar and vanilla in medium bowl with electric mixer on medium-high speed until soft peaks form. Add to chocolate mixture; stir gently until well blended. Pour into prepared pan. Refrigerate overnight or freeze 3 hours. Unmold onto serving plate; remove plastic wrap. Cut into 12 slices. Place 1 slice on each dessert plate; top with 2 Tbsp. of the Raspberry Sauce and about 1 Tbsp. of the raspberries. Special recipes are fun to eat as part of an annual celebration. 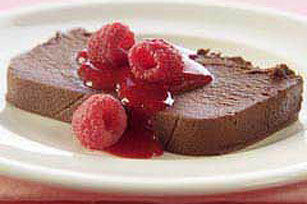 Enjoy a serving of this rich and indulgent dessert at your next party. Prepare as directed, spooning chocolate mixture evenly into 18 paper-lined muffin cups. Remove paper liners before serving. Makes 18 servings, 1 dessert cup each.